It is well known that the foundations of buildings are subject to loads which can result in deformation and subsidence. Hence, the analysis of foundation deformation must be conducted at the design stage. This article describes the computer simulation of foundation deformation. We propose an approach based on numerical solution of the stationary differential equation in partial derivatives. This equation describes the transversal deflection of a thin plate (foundation slab), taking elasticity into account, due to an external orthogonal force. The coefficients included in equation (1) are described in Table 1.
where is the bending moment at point . Finally, if the boundary is free, then the boundary conditions are stated for no external forces on the border. where denotes the coefficient of ground reaction [Н/m3] and is the bearing capacity [Pa]. where is the reaction coefficient of the pile [Н/m3]. Since the area of the plate is arbitrary, there is no general formula for the analytical solution of equation (1) and so numerical methods, in this case based on finite difference approximation of differential operators, are applied. Despite the set of equations (6) having three times more unknowns than equation (1), its finite-difference approximation is straightforward because the stencil for the approximation of the second-order derivative contains only 3 points. Due to the nonlinearity of set of equations (6), we use iteration methods to solve it numerically. We have provided a sample calculation for foundation deformation. Here, we assume that the material of the foundation is concrete having the physical properties shown in the Table 2. Let the slab have a circle shape with the center at point m, m, and radius m. The slab thickness is equal to m. We consider two cases of slab connection with piles. In the first calculation, the slab stands on 60 piles: 40 piles are arranged in a circle with the center at the point and radius m, and the remaining 20 piles in a concentric circle with radius m. The coordinates along the Oz-axis of top points is m. The pile reaction coefficient is Н/m3; the load capacity of the piles is hPa. External pressure (perpendicular to the plane of the slab) is kPa. Thus, with respect to the pressure created by the slab load, the total pressure at each point of the slab is equal to kPa. The boundary of the plate is free. 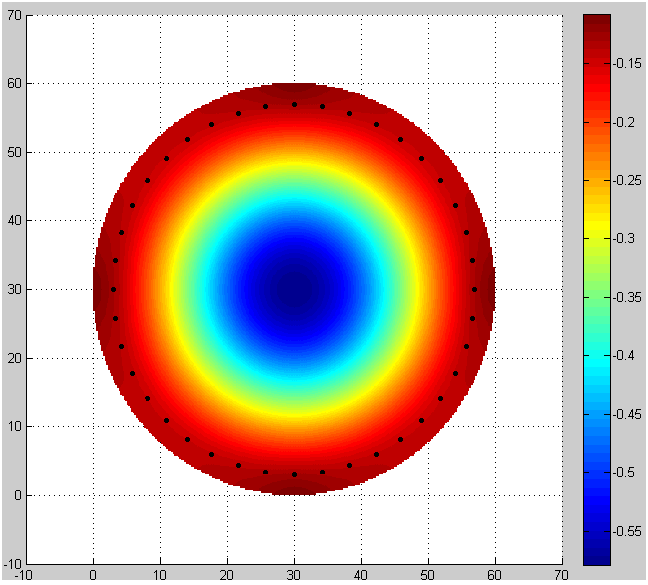 The foundation deformation results are shown in Figure 1. Figure 1 shows the foundation slab vertical deflection by color distribution, with the black dots indicating the piles. Note that the load on any pile did not exceed its load capacity . 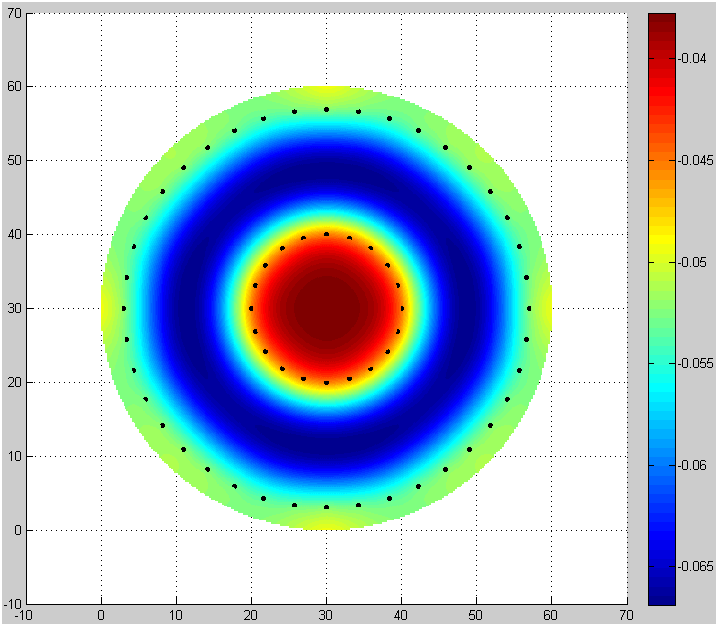 The maximum deflection of the slab was m.
In the second computation, the inner circle of piles is removed and the results of the computation are shown in Figure 2. As in the first calculation, the load on any one pile never exceeded its load capacity , but the maximum deflection of the foundation slab rose to as high as 0.62 m, which is sufficient to destroy the foundation. The article demonstrates the application of numerical simulation for the evaluation of non-uniform deflection of foundation slabs under various loads with specific load-bearing pile arrangements. The same approach can be also used to calculate the deformation of foundation slabs on subsiding permafrost ground due to thawing. Timoshenko, S. and Woinowsky-Krieger, S. Theory of plates and shells. McGraw–Hill New York, 1959. Aynbinder A.B. Raschet magistralynykh i promyslovykh truboprovodov na prochnosty i ustoychivosty: spravochnoye posobiye (Main/Field Pipeline Strength and Stability Calculation: Reference Book). Moscow: Nedra, 1991. 287 p.
This entry was posted in Mathematical notes. Bookmark the permalink.